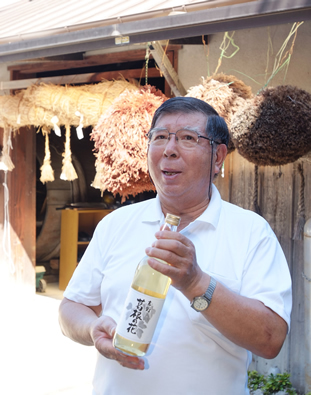 Hand-crafted, locally-produced sake brewed with rice grown ourselves from seedlings: a family business from seed to sale. Your business has almost a 300-year history, doesn't it? ceaselessly. Representative Director Koichiro Nishiumi. Our company was founded in the early 18th century, in the age of the Edo shogunate's eighth shogun, Yoshimune Tokugawa. In those days, village headmen were thought to gather a great deal of rice. The head of my family is the successor to the Tahei professional name--as probably I, will be too, as the ninth-generation owner. We've never been a big brewery, but for generations, people have said that they've liked our sake, and we've always continued to make hand-crafted sake, focusing on pleasing the local residents. Everyone in our family has our own line of business, but we all work together to brew our sake. After I graduated from college, I taught industrial chemistry at the prefectural technical high school. After retiring, I began to pursue our family business in earnest, but even now, I still teach at the technical high school in the city of Himeji. I understand you also grow your brewer's rice as a family. 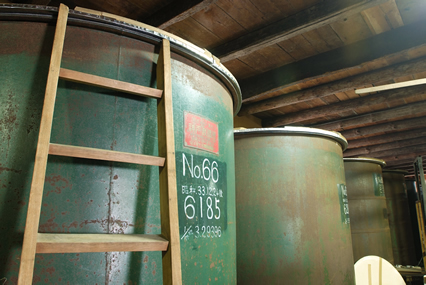 The filled tanks help one understand the long history of sake brewing. We start by sowing seeds in our nearby rice paddies. Our paddies are about as large as normal baseball stadium, so we collect about six tons of brewer's rice every year! Growing seedlings takes time, so generally, many places just buy them from an agricultural cooperative. We, though, insist on doing everything ourselves, by hand, so we don't cut corners where the seedlings are concerned. Naturally, we don't use chemical fertilizers in growing our brewer's rice. We use natural fertilizers--lotuses, rice bran, oil cakes. We even gather our own rice bran, from when we polish our rice. It takes time and effort, but it allows us to grow safe, secure rice. We spare no effort, I think, in making sure that we use rice where we've know and seen who's grown it. What kind of sake is your flagship brand, "Sora no Tsuru" ("Crane of the Sky")? Sora no Tsuru takes its name from the story of a dream about riding on a crane that dances into the sky and spreads its wings in the clouds. Our daiginjo sake (high-quality sake brewed from rice grains milled to 50% or less of their original weight) and daiginjo made with no added alcohol or sugar use 100% Yamada Nishiki rice we've grown ourselves. We make it with handmade malt and brewing water from a spring on our own premises, and we ferment it slowly at low temperatures. With our "no added alcohol or sugar" daiginjo, we also make mature, well-cured sake that's fermented for four-and-a-half years. 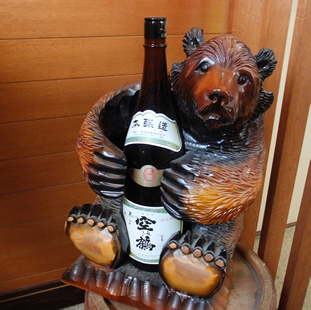 For celebrations such as weddings and New Year's we also have our "Okina no Sakazuki" label. You also have different products such as rice wine and kudzu sake, don't you? The company's original label can also be ordered from the small lot. 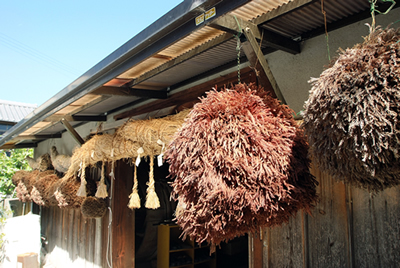 For our rice wine, we use Yamada Nishiki and Fuku no Hana for the brewer's rice and ferment it with wine yeast. It's popular with women for its sweet, fruity flavor that's similar to a mild white wine. Our "Kakkon no Hana" kudzu sake is also quite a rarity; we are the only brewery in Japan that makes it. We perfected it in 1999, and it was quite the media sensation. The idea for it was first proposed to us by Professor Hyoe Tsugawa, a global authority on kudzu at Kobe University. Kudzu has isoflavone, which is extolled for its health and beauty properties, and Prof. Tsugawa asked us: couldn't we make it into a refined sake? We tried using Yoshino kudzu from Nara, but the kudzu had a distinctive scent, and so it didn't work very well. We spent three years creating a taste that everyone could enjoy. The sake is known for its sweet flavor and a refreshing bouquet, and we recommend it as an aperitif! 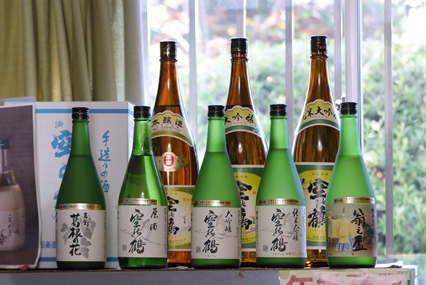 Almost all our sales of the sake are direct from our brewery. That way, we can make it available to our customers at competitive prices. You might be the smallest brewery in Japan, is that right? It's because of our small size that I hope we continue to stand not on grand plans for expansion, but on our high quality standards and our sterling reputation for brewing sake. Kudzu rare wine which I made with Hyogo Yumenishiki Yoshino and kudzu of Nara. Sweetness and clean, the aperitif chilled. Use 100% Yamada Nishiki that was grown in paddy field house, gem of the feelings that were fermented slowly and carefully at cryogenic temperatures. Were charged in a wine yeast Hyogo Yumenishiki, I finished in taste like white wine fruity sweet. ・Online store : Store click here!